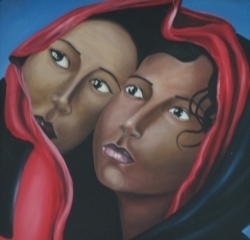 “Behind adversities are opportunities” goes the saying. After the rust that affected thousands of families working in the coffee chain, repeatedly we heard about the adversities of the drought: “the first planting season was lost”, “the families´food reserves have been used up”, “the water table has been reduced”, “there is a risk that the second planting will not happen..nor the third,” “insects are appearing like the flying locust, the cotton weevil, mites and the pink hibiscus woodlouse”, “cattle raising is at risk due to the scarcity of water for drinking and for grazing,” “exodus from the communities”, “increase of cattle rustling because of the economic crisis,” “ microcredit is protecting itself in the face of the drought.” Without a doubt, it is important to be concerned about the effects of the drought in the short term. In this article we call attention to the fact that the drought is being understood as if it were only a natural phenomenon, and the human activities that contribute to it are being ignored. Understanding these actions and their impact would allow it to be seen as an opportunity for thinking about ways of overcoming the challenges that the drought imposes, and developing a possible long term perspective. The FAO (2012, Estudio de caracterización del corredor seco centroamericano http://reliefweb.int/sites/reliefweb.int/files/resources/tomo_i_corredor_seco.pdf) identifies the dry corridor of the region. 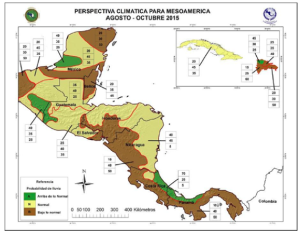 Out of a total of 75 million hectares in the region (Guatemala, El Salvador, Honduras and Nicaragua), the corridor covers 15.9 million hectares, in other words 21%; out of this total 42% is low effect drought, 50.5% large effect drought, and 7.5% has severe effects. See map. What is alarming is that the National Oceanic and Atmospheric Agency of the US (NOAA), in addition to confirming the presence of El Niño, points out the possibility that it might be extended into the first months of 2016 (prolonged dry season and early withdrawal of rainy season), and on top of that, concludes that the below normal rainfall for the months of August to October will affect the dry corridor and beyond in each country. 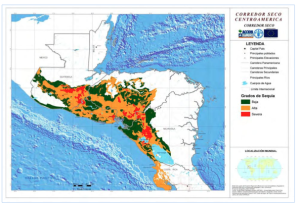 (See map below; Central America Agricultural Council, Climate Change and Holistic Risk Management Technical Group, 2015, Current status of El Niño, climate perspective, implications for farming and recommendations for regional measures; http://infoagro.net/archivos_Infoagro/Regatta/biblioteca/ES_S%C3%ADntesisWebinarEstad.pdf). It is said that the behavior of the current rainfall is similar to that of 1976 and 1982, that the drought is similar to that of 1997, and that the seriousness of the situation is that the drought goes back to last year, 2014. In other words, the drought is becoming something structural. What has caused this? The absence of humidity in the atmosphere, which is made worse by the increasing variability of the rainfall, including the increase in temperature, particularly on the ocean´s surface. This variability has been caused by human actions that generally are interconnected. 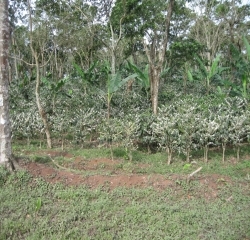 First, deforestation causes soil erosion, which is why the soil then retains less water, the water is less able to infiltrate and the soil loses its fertility, so then flooding increases, and the creeks and springs disappear, rivers dry up, crop yields decrease, and become more vulnerable to rainy season droughts and infestations, and with this the families lose their capacity to maintain themselves. Secondly, this deforestation is accompanied by another chain of pressures that include the “hamburger effect” (fast food in the United States at the cost of the forests of Central America), increase in extensive cattle raising, the advance of the monocropping haciendas (producing sugar cane, peanuts, sorghum, tobacco…) on large areas emptied of trees, land concentration that expels families from their communities, and the consequent reduction of diversified farms and manual agro-industry (cheesemakers, grinders, cacao drying…). Third, this dynamic of deforestation and land concentration is accompanied by financing, research and technology – by and for – large monocropping production, but it is dressed up as modern economics and even the first “victim” of the drought. There the drought appears as a “natural” phenomenon, as a matter of “those poor” subsistence peasants, and organizations discussing the size of its impact. One hypothesis for any territory in the dry corridor for the last 70 years would be that the combined effect of these three factors (degradation of natural resources, concentration of the land and accompanying chain of pressures) has increased the variability of the rainfall, and has resulted in less capacity to resist the impact of the drought, which is a human result that underlies the current of injustice “an underwater riptide”. If the drought expresses the social injustice and the merchantilization of the land (and the climate), and it is a human outcome, then it is a changeable phenomenon. Recalling the words of Chesterton, “playing the violin when Rome is burning is amoral, thinking about a hydraulic system is the task of the researcher”, thinking about strategies for overcoming the drought is more than suggesting technical solutions (communal gardens, raising iguanas, drought resistant crops like pineapple, reforestation, agro-forestry and silvo-pastoral practices, protection of water sources, irrigation systems in harmony with the profitability of the crop and without affecting the water basin, combination of agriculture and ranching, and diversified farms), it is thinking about how to implement over the long term. What follows indicates some points along those lines. 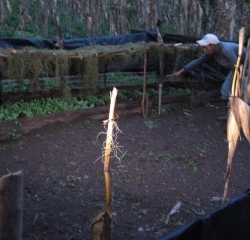 Second, what is crucial is awakening among the families a vision of change on their farms and their communities, that they cultivate a long term perspective, and that they hold to that vision. One family: “dreams of the day my friends visit me and say, ´how beautiful your farm is´; here the entire family is working to see that day.” This awakening and perseverance is possible when various families, aware of the fact that alone they cannot overcome the drought, organize into cooperatives, associations or some form of community, and do so in alliance with organizations or institutions of the region that are capable of putting on the shoes of those families, commit to their formation, and provide follow up to one another for various years. Finally, creating the conditions so that the two previous points can become possible. Financial institutions, instead of “shielding themselves” (reducing credit to non-ranching families or vetoing credit to dry zones), increasing their loans to intelligent investments that would allow them to move past the drought. Universities can create interdisciplinary certificates on development in high risk dry territories with the participation of rural leaders and professionals, with follow up intervals on experimentation processes. Commercial enterprise chains that buy products from the dry corridor within a framework of subcontracting relationships for various periods. Fiscal policies that provide incentives for sustainable productive diversification, and penalize land concentration and monocropping. 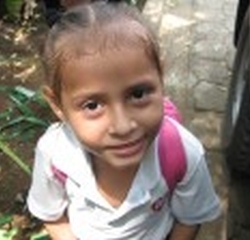 * René (rmvidaurre@gmail.com) has a PhD in development studies, is a collaborator with the Winds of Peace Foundation (WPF) (http://peacewinds.org/research/), an associate researcher with IOB-University of Antwerp (Belgium) and the Research and Development Institute , Nitlapan-UCA (Nicaragua).